I just could not help thinking about the award winning coffee Laura Perry made. I mean, how does it taste like? Coffee and Mascarpone combined is like tiramisu right? Will I also start to love that mascarpone? 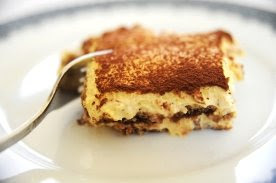 Too many questions so I decided to research on an Italian tiramisu recipe to share with everyone. Prepare the coffee: if you're using the Italian stove coffee maker , depending on its size (2, 3, 4, 9 serving), consider making about 9 coffees. It will serve to wet the biscuits. Beat the yolks with the sugar white until it gets clearer. Add the mascarpone and put apart. Beat the egg whites until whipped up. Mix with the other cream. Take a square pan (maybe a pyrex. If you have a rectangular one, with about 10 cm of width, it'll be easier for you to place the biscuits on the sides and bottom, and then come making layers), and begin with the first layer of Pavesini biscuits wet in the coffee. tip: Wet less the first biscuits, as they are going to be the lower ones and will automaticaly get more cream and coffee from the ones that will come above). Make then a layer of cream and spread a little of instant coffee (it's a real tip that will make your tiramisu really special. Spread some cocoa powered and go ahead until finishing the biscuits. The last layer is the cream one, with powdered cocoa and coffee on. Put it into the refrigerator for at least 5 hours. tip: I used to cut it into individual portions, plastic wrap it and freeze. When I wanted to eat, a minute inside the microwave and it was like having just done it! Could Laura Perry's mascarpone macchiato taste like tiramisu? What a treat if I could make or at least taste it. It looks like coffee and mascarpone go together perfectly. I have realized that this entry besides having an Italian tiramisu recipe is just full of questions. Yes I do have a lot of it today but at least one thing has been answered and that is...starting today I am officially a mascarpone lover! How about you?